This story was updated on April 11 at 7 a.m. ET. NASA is expected to announce the final resting places of the agency's space shuttles Tuesday (April 12), on the 30th anniversary of the first-ever shuttle mission. NASA is retiring the shuttle program later this year, and nearly two dozen museums around the country are vying for the right to display one of the workhorse orbiters. 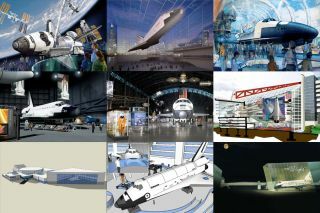 Up for grabs are the shuttles Discovery, Endeavour and Atlantis — important pieces of spaceflight history that would doubtless pull many visitors through the doors. That's the idea, for both the museums and NASA. The space agency has said it wants the shuttles to continue serving the nation in retirement by jump-starting the public imagination and helping lead young people into careers in math and science. When NASA first solicited proposals from museums interested in displaying a shuttle back in 2008, 29 institutions answered the call. Since then, eight have dropped out for various reasons, bringing the list of contenders to 21. The Smithsonian currently houses the shuttle Enterprise, a prototype that made some glide tests but never reached space. Discovery is expected to replace it, putting Enterprise up for grabs along with Endeavour and Atlantis. While only Bolden and his team know for sure which museums will get these shuttles, experts have identified several front-runners. They include the visitor center at NASA's Johnson Space Center in Houston; the visitor center at Kennedy Space Center in Florida; the National Museum of the U.S. Air Force in Ohio; the Museum of Flight in Seattle; and the Intrepid Sea, Air & Space Museum in New York City. But all of this is speculation until Tuesday. Bolden's announcement — which also comes on the 50th anniversary of the first human spaceflight, by cosmonaut Yuri Gagarin in 1961 — will lift the spirits of a few museum officials and disappoint many others. And it will help families and schools start planning trips to see a piece of American spaceflight history up close.